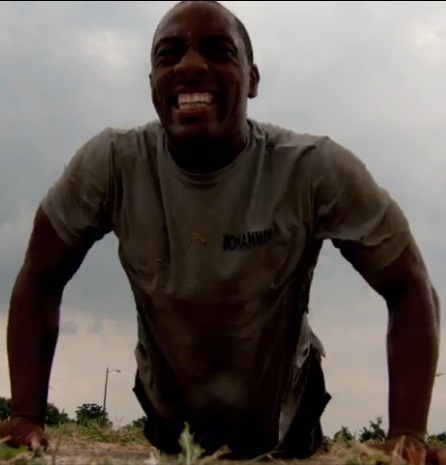 Always thought of as a job for men, more and more women are choosing police work. The Austin Police Department currently has 171 female officers and is looking for more women to join the ranks. To encourage more female applicants, APD is hosting a Women in Law Enforcement recruiting event onSaturday, October 19, 2013. Topics include application and training requirements, balancing home and work life, and career paths and promotion opportunities. 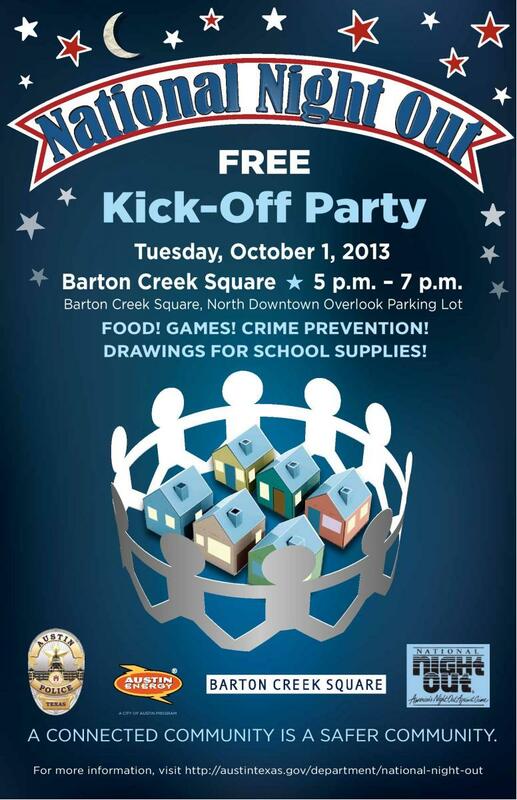 APD Recruiting staff will be on hand to speak with interested applicants. Speakers include APD Assistant Chief Jessica Robledo, who started with APD in 1988 and rose through the ranks to her current role, in which she oversees the Special Operations (SWAT and Bomb Squad), Specialized Patrol and Special Events, Highway Enforcement, Communications, and Victims’ Services Divisions. 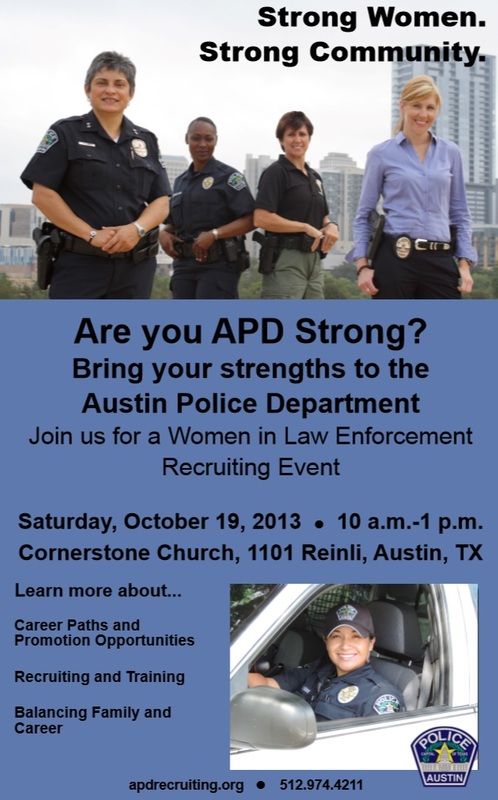 Women in Law Enforcement Recruiting Event: Are you APD Strong? Austin is a fast-growing, diverse community and APD offers a competitive benefits package including health and life insurance, vacation and sick time, retirement and many career opportunities. To learn about how to be APD Strong, visit apdrecruiting.org, email recruiting@austintexas.gov or call 512-974-4211. September 17 was the first night of the newest session of the APD’s Citizen Police Academy with almost 40 people registered to attend the session that will conclude with graduation on December 17, 2013. The class members were welcomed by SPO Jermaine Kilgore, who assumed duties as the CPA Coordinator early this year. As of June 2013, a total of 1,910 citizens have completed the Academy which was implemented in 1987. A meal of pizza, drinks, and cookies was provided by the Austin CPA Alumni Association whose President, Melinda Rodriguez, welcomed all to the class and assured them that they would benefit greatly by what they learn. She invited them to become members of the Alumni Association and to extend their knowledge of APD operations with volunteer opportunities available through the Association. Several members of the ACPAAA were present at the meeting to visit with class attendees and welcome them. Officer Kilgore briefly reviewed the agendas for the 13 weeks of classes this session and announced that ride outs with patrol officers for the class would be done in late October and early November. He thanked the class members for their participation and commitment to the Academy.